Chocolate and the Brain – What a combination!!! Home Archive by Category "Awareness"
When it comes to preserving and improving brain function, we need all the help we can get. Aging causes diseases such as dementia, stroke, Alzheimer’s disease, and Parkinson’s disease. Experts predict dementia will become much more common in the near future. Yet despite decades of research, there are no highly effective treatments for dementia. So, what’s the scoop on chocolate and the brain? A new review analyzed the evidence to date that flavanols (found in dark chocolate and cocoa) may benefit human brain function. Flavanols are a form of flavonoids, plant-based substances that have anti-inflammatory and antioxidant effects. Dark chocolate and cocoa are not the only foods that contain flavanols. Many fruits and vegetables are rich in flavanols, including apples, red grapes, broccoli, cherry tomatoes, beans, kale, and onions. Short-term consumption may be helpful. A study of young adults found that two hours after consuming dark chocolate (with high flavanol content), memory and reaction time were better than among those consuming white chocolate (with low flavanol content). However, other similar studies showed no benefit. Long-term consumption may be helpful. One study found that among adults ages 50 to 69, those taking a cocoa supplement with high flavanol content for three months had better performance on tests of memory than those assigned to take a low-flavanol cocoa supplement. Some studies demonstrated evidence of improved brain blood flow, oxygen levels, or nerve function as measured by imaging tests or tests of electrical activity in the brain after the consumption of cocoa drinks. The down-side was the changes did not improve performance on cognitive tasks, so it hasn’t connected the improved results directly to better brain function. While these findings are encouraging and intriguing, more research is needed, especially since most studies so far have been small and many were unable to eliminate the possibility of a placebo effect. Many people are more than willing to accept any suggestion that chocolate is healthy (if only to justify their high consumption of chocolate). But, it’ll take more than the evidence we have now to prove that chocolate or flavanols can truly preserve or improve brain function. And don’t forget, not all chocolate is the same. Dark chocolate and cocoa have high flavanol levels, while milk chocolate and white chocolate have much lower levels. Also, many types of chocolate are high in sugar, fats, and calories. So, even if dark chocolate turns out to be good for the brain, it’s unlikely that doctors will recommend a Godiva bar a day……bummer! One can still hope. People have been obsessed with reversing the aging process since the days of Ponce de Leon and his ‘fountain of youth’. In the last few decades, we’ve seen huge shifts in longevity in developed countries. More people are not only reaching old age, they’re reaching very old age. Researchers have been focusing their studies on finding new strategies to meet the concept of ‘successful aging’ – the avoidance of disease and disability and the maintenance of physical and cognitive functions with an engagement in social and productive activities. During aging, sensorimotor, cognitive and physical performance all decline, but new research indicates that they can improved by training and exercise, indicating that age-related changes are treatable. Dance therapy is increasingly used because it combines many diverse features making it a great tool for increasing physical performance – as well as brain performance! For years, studies have been focused on programs aimed at improving aerobic capacity and cognitive functions in elderly individuals through physical exercise programs since there is a close relationship between physical fitness and cognitive performance. But new research finds the benefits of dancing may go well beyond physical exercise therapy because dancing provides increased sensory, motor, and cognitive demands. Dancing is an activity that emerged from a need for social interaction and non-verbal communication, and it is a universal human expression consistent across generations, cultures, and social classes throughout the world. Compared to activities such as physical exercise or playing an instrument, dance comprises rhythmic motor coordination, balance and memory, emotions, affection, social interaction, acoustic stimulation, and musical experience apart from its requirements for physical activity. This unique combination of properties makes dance a powerful interventional approach to aging. For these reasons, dance has also been established as a therapeutic tool for the treatment of Parkinson’s disease, dementia, overweight children, and patients with serious mental illness. Research has found that dancing is a promising neuro-plasticity tool that elicits activity in multiple brain regions. A recent study compared the effects of dancing, walking and walking combined with a nutritional intervention to an active control intervention (stretching and toning) on the brain’s white matter integrity (WMI). WMI is a reliable marker of aging in the brain, and lifestyle interventions that promote maintained or improved WMI may be a key ingredient in protecting against cognitive decline and dementia. Subjects who participated in the dance therapy, which offers a more challenging complex ideo-motor “workout” for the body and the brain, saw significant levels of increased WMI in the fornix, a pathway area of the brain associated with the hippocampus, a key location for learning and memory. The conclusion was that a proactive program that combines physical, cognitive and social engagement may be a “best bet” for maintaining or improving white matter integrity across the aging process. THE TAKEAWAY: Dancing is just one way to “up” the ante and offer workouts that not only challenge the body but engage the mind and offer social opportunities. This study confirms the added value of such complex ideo-motor activities over simple motor workouts such as walking, as well as the boost of social-based training for better brain health. So don’t just sit there – get up DANCE! Turn Summer Brain Drain into Brain Gain! While summer break is a fun time packed with family activities it’s also when a phenomenon strikes that teachers know all too well—the “summer slide” or “Brain Drain” – the loss of knowledge and ability that occurs when formal education stops during the summer. Research shows that all young people experience learning losses when they don’t engage in educational activities during the summer. In fact, the average student loses approximately 2.6 months of grade-level equivalency in math computation skills over the summer months. This learning loss affects children when they begin their new school year in September because teachers typically spend four weeks re-teaching or reviewing material that students have forgotten over summer break. Playing ‘catch-up’ as the school year begins can also negatively effect your child’s self esteem. While your brain is not a muscle, the adage ‘use it or lose it’ certainly holds true for your brain too. Mental exercise can keep the brain strong, just as physical exercise can keep the body strong. 20 Questions. Think of a person or thing and give your child 20 chances to guess what it is by asking yes or no questions. Sharpens memory, logic and reasoning skills. Rhyme Time. Have your child choose four rhyming words and use them to create a poem. For younger kids, simply say a word then take turns coming up with words that rhyme with it. Builds auditory analysis, verbal rhythm and memory. Needle in a Haystack. Take a page from a newspaper and time your child as she circles all occurrences of a specific letter or word. Improves visual processing speed and sustained attention. Counting Counts. Encourage your child to count by 2’s, 3’s, 4’s etc. when they go up stairs, dribble a basketball, swing on a swing set or jump rope. Builds math fluency, processing speed, divided attention and memory. Play Time is Gain Time. Play is crucial to healthy brain development. Prioritize play with your kids to keep their creative juices flowing and minds working. Pick a Pen Pal. It doesn’t matter whether it’s a family member or friend, near or far, writing letters will give kids a chance to rehash and share their summer adventures and practice their writing in the process. Teach mini-lessons. Transform everyday activities into learning opportunities. Children can count change, read directions for a trip, write a shopping list, or calculate a recipe’s measurements. Gather activity books. Give children their own activity book with crossword puzzles or number games customized for their specific age group. Set a “due date” to keep them on track, but let them work at their own pace. Strategize screen time. Educational computer games or apps can engage students’ minds, but make sure your child is spending enough time away from the screen. Assign a daily block of time for family members to turn off phones, computers, and the TV, and instead play a board game or read together. Talk to your child. So many conversations between parents and kids during the school year are directional: “Get up; get in the car; do your homework.” Before you are back in the grind make some time to chat. Spend time getting to know how your child feels about going back to school, any concerns they may have. Have Kids’ Dinner Night. Once a child is 10 or 11, have him be fully responsible for dinner one night. That means coming up with the shopping list (Mom or Dad still has to pay), setting the table, preparing the meal, deciding on the dinner conversation topic and cleaning up afterward. It involves math, organizational and, perhaps most importantly, life skills. Middle school is a huge transition and, for many kids, can be fraught with academic and social insecurity. But it’s also a time when kids are discovering different ways to learn, and that can make summer learning especially important. Do something new. Middle school is all about exploring new interests. Your child may discover an interest that you never imagined. So expose them to a new sport, a new hobby, a new class. Be nontraditional. If you want your child to start reading before school starts, great. But don’t force him to do the reading you think he should be doing. Going online to read something and having a discussion about it can be just as educational as reading a novel from a book list. Help make connections. For middle school kids, relevancy is so important; if they have experienced something, then they can understand it better. So go downtown, visit a museum or an art gallery. Social learning is important for kids this age. It’s very difficult for adults to understand how stressful high school is. The amount of stress high school kids put on themselves to get into college means that they are thinking about their future constantly. By the time kids are in high school, you want them to understand that learning is a lifelong pursuit. Start a store. Use math skills and organization to plan the store and “sell” goods. Explore “Going Green.” Your carbon footprint and whether recycling is all it’s cracked up to be: These activities involve not only math skills, but applying research to higher level critical thinking and analysis. Go to an outdoor movie festival. It doesn’t feel like learning, but watching ‘Casablanca’ absolutely is. And so is the shared experience of discussing it afterward. Be the editor of your family newsletter. Practice journalistic and writing skills, including interviews, news, pictures, advertisements and even cartoons. Grow your own food. Children who grow their own food are more likely to eat fresh fruits and vegetables, as well as gaining knowledge about nutrition and healthy eating. Do something that opens your world. Not everyone can study French in Paris. But there are so many opportunities to learn by accident. And if you’re having fun and you learn something, you’ll remember it forever. Take some positive steps to ensure the brain is ready, willing and able when school starts! Finally- Biological proof what texting and driving does to your brain! Its a fact. We’re using our smartphones as the primary form of communication in our daily lives. Talking, texting, gaming, social media, directions, banking, taking photos, internet searches, the list goes on. It’s become our way of life – the norm. But how much do we really know about the neurological effects of smartphone use? To find out more about how our brains work during textual communication using smartphones, a team led by Mayo Clinic researcher William Tatum analyzed data from 129 patients. Their brain waves were monitored over a period of 16 months through electroencephalograms (EEGs) combined with video footage. Dr. Tatum, professor of neurology and director of the epilepsy monitoring unit and epilepsy center at Mayo Clinic in Jacksonville, Florida found a unique ‘texting rhythm‘ in approximately 1 in 5 patients who were using their smartphone to text message while having their brain waves monitored. This ‘texting’ rhythm was also found in iPad users, leading researchers to hypothesize that the presence of this different brain rhythm while using smartphones and hand-held devices might be caused by their smaller screens, which require more concentration. The researchers concluded that this study could have significant implications for all brain-computer interfacing. Although more research is needed, researchers are beginning to unravel the responses generated by the brain when it interfaces with computerized devices. This biggest implication of this finding is driving while texting. While it’s commonly believed that texting and driving can be dangerous, there is now biological evidence why you shouldn’t do it! Watching TV is something virtually everyone does, but did you know that TV can actually be harmful to you? Television viewing can, for example, increase your risk of premature death, reduce your level of intelligence, completely obliterate your ability to concentrate and increase your risk of developing neurodegenerative brain disorders. Researchers in Australia have concluded that watching television increases risk of death from heart disease, strokes and even cancer. Every hour spent watching television each day increases the risk of dying from heart disease by almost a fifth, say scientists. Studies found that people who sat in front of the box for more than four hours a day were 80% more likely to die for reasons linked to heart and artery disease. “Even if someone has a healthy body weight, sitting for long periods of time still has an unhealthy influence on their blood sugar and blood fats,” said the study’s lead researcher, Prof David Dunstan, from the Baker IDI Heart and Diabetes Institute in Victoria, Australia. While we know a sedentary lifestyle can be dangerous to our health, few studies have examined the effects of what watching too much TV can do to our brains. Research carried out over 25 years by California’s Institute for Research and Education has recently shown the dangers of television for our neurons, even in those who exercise regularly. The participants were divided into two groups according to their television habits: frequent viewers (more than 3 hours of television per day) and moderate viewers (less than 3 hours per day). Their cognitive function was evaluated using the DSST (Digit Symbol Substitution Test), Stroop test, and RAVLT (Rey Auditory Verbal Learning Test). The results showed that the most frequent viewers over the 25 years (10.9%) were more likely to perform poorly on the cognitive tests. Secondly, the participants with low physical activity (16.3%) performed poorly on the DSST. Thirdly, when compared to moderate viewers engaging in regular physical activity, frequent viewers who exercised little were nearly twice as likely to perform poorly on cognitive tests. Too much television and a lack of physical activity represent independent factors linked to a decline in cognitive brain performance. And the worst news: Exercise can’t compensate for the harmful effects of too many hours spent watching television. If you’re athletic, you are undoubtedly maintaining your cognitive abilities better than sedentary individuals, but if you also watch television for more than three hours per day, it is likely to have negative consequences on your intellectual activity. Television reduces your ability to think critically. When you watch TV, brain activity switches from the left side of your brain (responsible for logical thought and critical analysis) to the right side. This is significant because the right side of the brain tends not to analyze incoming information. Instead, it uses an emotional response which results in little or no analysis of the information. In other words, this is like someone telling you something and you believing what they say without doing your own research. Your brain is actually more active when you are sleeping than when you are watching television! Since the health of your brain is largely determined by how much you actively use it, watching too much television can have a detrimental effect on the health of your brain. One of the reasons that brain activity is so low when watching TV is because you really don’t have to do anything. When you read, for example, you have to mentally create images of what you are reading. This requires significant brainpower to do so. So, the saying ‘TV rots you brain’ has more truth to it than you might imagine. Excessive television viewing has also been linked to degenerative brain disorders later in life such as dementia and Alzheimer’s disease. Do you ever wonder where your mind went? Have you ever pulled into the driveway and thought, “I’m home,” and then realized that you have no recollection of the drive? Or maybe it’s after you’ve hung up the phone after the conversation and thought, “what was it we agreed to?” This is how the distracted mind works, and we all have one from time to time. As pointed out in the March/April Scientific American Mind article, “Being in the Now” by Amishi P. Jha, the opposite of a wandering mind is a mindful one. She goes on to explain how having a “focus in the present” can make us happier and healthier, and that being mindful improves our ability to pay attention and concentrate. While this sounds like an easy fix for everyone, there is far more too it. Mindfulness is being engage in the here and now, without reacting to it or evaluating it. Just being. Jha reviews recent studies completed at the University of Pennsylvania, Harvard Medical School, and Carnegie Melon University that all demonstrate the broad application of mindfulness, and how your quality of life can be enhanced physiologically, emotionally and cognitively. Being able to direct and monitor attention can improve your performance in all aspects of your life. The good news is, the path to becoming mindful is not as hard as you might thin. It all starts with your breath. Find a comfortable place to sit, close your eyes, and pay attention to your breathing. Follow the movement through your body. How do you breathe? Are you breathing short, choppy breaths with the air stopping in your chest? Do you feel the air push down into your abdomen and feel your stomach expand? When you start to find your mind wandering off – and it will – come back to your breath. Focus on the breath coming in, pause, and the breath going out. Finding focus can be hard to do, but this is training you to become mindful. An optimal breathing rate is between 4 to 7 breaths a minute. When we are talking with our family and friends, we are breathing 12 – 14 breaths a minute, as we have to, to fuel conversation. You’ve probably never thought about how you breathe. The physiological effects of an optimal breathing rate can have profound impacts on your health. Imagine a car never getting the correct mixture of gasoline and oxygen, always running at half of it;s capacity. But once the two are synched up into an optimal mixture, the car runs like it never has before. This is exactly like your body. Becoming more mindful can enhance your life in many ways, and the first step is to master your breathing. Block out 10 minutes a day for the next two weeks for your “workout”. Feel your whole body move with your breathe, think about what is going on around you, what you hear and smell. Be receptive to all the sensations and breathe. You are on the path to becoming mindful, improving your brain and most importantly your life. Summer is officially here and what better time to be thinking about brain performance than the eve of the 2012 Summer Olympics kick off? The level of training, both physical and mental, that is required to endure the stress of world class competition is phenomenal. The average individual probably doesn’t consider the level of stress that comes with such competition, or an athlete’s ability to cope while taking their performance to a higher level and maybe even setting new world records. Is it as simple as mind over matter? The book, Promoting Mental Agility through Cognitive Control and Mental Representation, takes a look at these connections and provides a framework for understanding creative adaptive thinking and mental agility. The book explains that the mind is not only responsible for cognition, but also deeply integrated with action, perception and emotion. Mental agility therefore enables the physical agility required for optimal performance, and helps to allow our bodies to excel at a higher level of activity. So when you are watching the Olympics this weekend take a moment to consider the level of mental excellence and strength that this competition showcases, not just the physical. The text is available on Amazon.com. Bullying goes on everyday in all walks of life. There are different forms of bullying, be they physical, verbal, or sexual. However, all of them are demeaning and hurtful to the person on the receiving end. It occurs at school, in the work place, in the home, and even at church. It is everywhere, and the worst part is that bullying is a vicious cycle, where the victims often become bullies themselves. Bullying can be deadly. Thirteen years ago, April 20, 1999, the tragic school shooting at Columbine High School showed us just how deadly it can be. The death of 12 students and 1 teacher evoked a lot of debate around gun control laws, the role of violent video games, and school security. However, it also began to shed light on bullying as a root cause of tragedies such as this one, forcing people to address the problem that the two students/gunmen responsible had been outcasts and bullied to a point of mental distress. Bullying generally can start at school. While it is hard to imagine how one could hope to control such a widespread problem, schools are beginning to do just that. A colleague and I recently had the opportunity to tour Dallas Academy and see first hand how a school is combating bullying in the hallways and classrooms. Leigh Richardson, Henri Braun and Dallas Academy Headmaster Jim Richardson discuss the school’s bullying program. 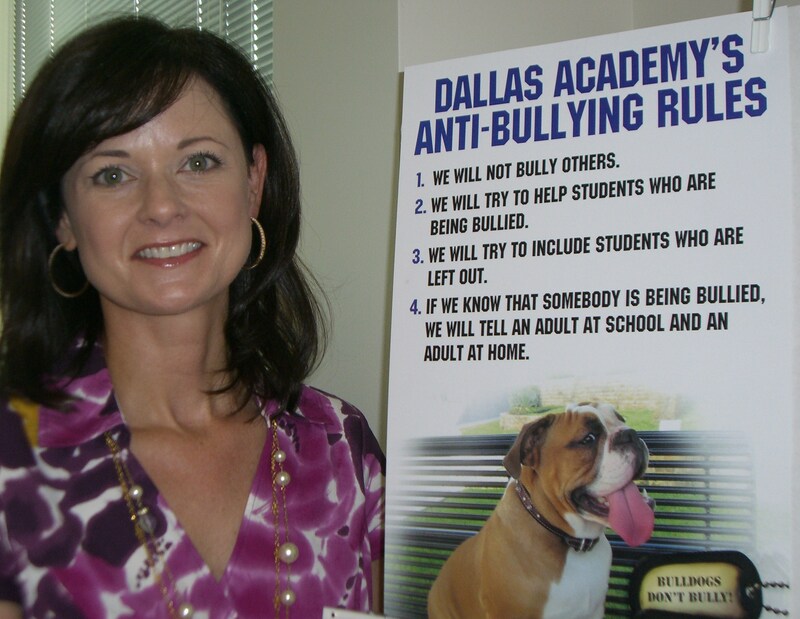 Dallas Academy, who’s mascot is the bulldog, works with a unique group of students. Their mission statement is to restore the promise of full academic enrichment to students with learning differences. Learning differences often involve problems with reading and writing, and their curriculum involves two hours a day skill work on these problem subjects. And, the kids love it. We walked in and out of the classrooms as Headmaster Jim Richardson, asked the students if they were having fun, only to be answered by emphatic and sincere groupings of “yes” at every turn. I kept waiting for that one “no” but it never came. Jim has been there since 1983, and knows the school from the ground up. He has been involved in activity at every level. What he and his team have created there is pretty special. As we toured the campus Henri, one of my colleagues noted how relaxed all of the students appeared. The campus is very peaceful, with plenty of trees and natural light, and feels like a warm and nurturing place that fosters learning. So, in this beautiful setting where everyone is having so much fun learning, why would Dallas Academy spend over a year training its teachers and administrators on an anti-bullying program? It is an expensive and time consuming process. WHY? It’s because those who work at the Dallas Academy appreciate the unique population of students that they have. They understand the difficulties that these students have had in other environments, and want better for their kids. It’s as simple as that. They realize that even in an environment such as this, the potential for bullying still exists. Despite all the successes and hard work, the faculty at Dallas Academy knows that the students are only human. With the help of their teachers and staff, these students who could have otherwise easily fallen into bullying have managed to rise above and make the Dallas Academy a haven and natural environment for learning and personal growth. The administrators walk their talk, and so do the students and their parents. Please take the opportunity to learn more about their bullying program, and visit the campus on May 9th for a parent’s presentation on bullying. For more information click here, http://www.dallas-academy.com/. If you have a child with learning differences, or if you think that your child may be a victim of bullying, then take this opportunity to learn what you as a parent can do to help your child. You won’t be sorry if you go. I was so inspired during my first vist, I can’t wait to go back. The kind of example that the Dallas Academy is setting might even cause you to stop and examine your own daily practices, and ask yourself how you can better the environment in which you work and learn in. This Guy Took Our Breath Away. What can you do with a 49 cent jar of bubbles and a heart of gold? 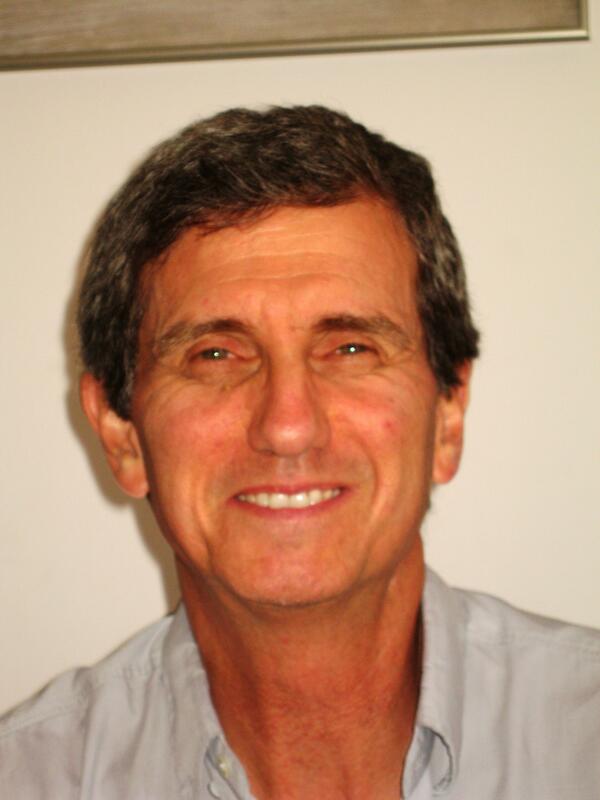 Daniel Hamiel, implementing biofeedback techniques in schools all over Israel. Touch 250,000 kids, teach them to breath properly and develop necessary coping skills to deal with everyday life situations and trauma. I met Daniel Hamiel at a conference this year and heard his unbelievable story that was both touching, and inspiring. Daniel created a school resilience program in Israel where missile attacks, war, and natural disasters have become a fact of everyday life. This leaves children with anxiety, nightmares, fears, difficulties with school and sleeping, detachment, and social withdrawal. With this level of trauma everywhere, how could you hope to create balance in a child’s life in that environment? Think about all the simple things we do to create balance within our lives. Taking time for yourself, exercising, eating right, balancing our work and family needs; as simple as it could be, it still doesn’t ensure that we do it, despite the fact that we know it works. Not everybody in Israel has the opportunity to create this kind of balance due to the situation and environment in which they live. The country stays in a constant state of survival mode, where people are thankful for each breath they take. Breath is life. On a brief aside, did you know that research shows a high correlation between high blood pressure and poor breathing? Nothing is more basic than breathing. We have to do it, but we don’t understand the impact that breathing can have on our well being. We don’t think about the physiological function that occurs, and the impact that breathing has on our heart beat. Did you know if you slow your breathe down, you can change your heart rate? If you change your heart rate you feel calmer. Breath can be a powerful tool and an easy one to master. Daniel Hamiel is teaching many people to breathe properly through a simple and readily available activity, blowing bubbles. 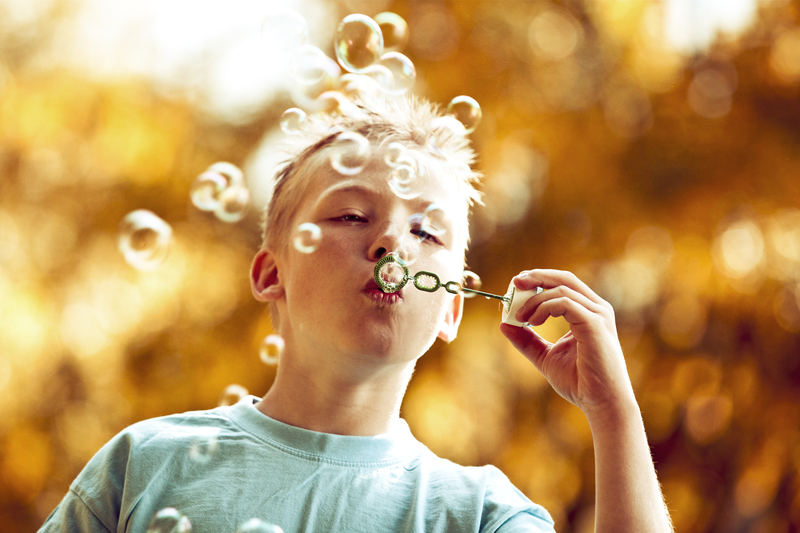 Bubbles, that is a flash back memory, two little boys running around blowing bubbles, fun times. We all have fond memories of blowing bubbles with our children, they cost next to nothing, and you can do it anywhere, anytime. But I never thought about using bubbles to teach people how to breathe. Think about what happens when you slowly exhale into a ring doused with soapy solution, a big beautiful bubble emerges. You are controlling your exhalation, probably to a count of six, and you are breathing at an optimal rate. Daniel, along with a staff of three, has been to going into the school systems and teaching these proper breathing techniques to the counselors. In turn, the counselors teach the teachers, and of course, the teachers teach the children. The children teach the parents and their siblings. How simple can that be? Simple enough to work anywhere, anytime. Daniel is helping little by little to enact change and bring a small sliver of calm into a very turbulent part of the world. We encourage you to learn more about your breathing patterns, visit www.drweil.com. Or, place your hand on your abdomen and count as you inhale and as you exhale. Try to get to a count of 6 to begin with, if you are full of air before you get to 6, then pause and exhale. Aim for 6 seconds of breath in, and 6 seconds out, resulting in 5 total breaths a minute. This is the optimal amount of breath for relaxation. Get a feel for how you breathe, and try to bring some calmness into your crazy day.